The Brostrom/Gould operation is a repair of damaged ligaments on the outer (“lateral”) side of the ankle. If you have torn the ligaments on the lateral side of your ankle and the ankle keeps giving way on you, you would normally be prescribed a course of physiotherapy to settle down inflammation in your ankle, strengthen the muscles on the outside of your ankle (peroneal muscles) to help control the joint better and ‘wobble-board’ exercises to re-teach the nerve endings inside the ankle to work better. If the physiotherapy does not improve your ankle, we would then arrange a ‘stress X-ray’ to confirm that your ankle is truly unstable and possibly an MRI scan to check there is nothing else the matter with the ankle. If you continue to have problems, you would have the choice between wearing a lightweight brace on the ankle while doing the things that cause your ankle to give way, or having an operation to repair the damage. If you have very lax or stretchy ligaments generally you would be best to have the torn ligament replaced with synthetic material. Otherwise we would recommend a simple repair of the ligament, which can even be done many years after the original injury. This is the Brostrom operation. A cut is made over the outer side of the ankle. The remains of the ligament are found. 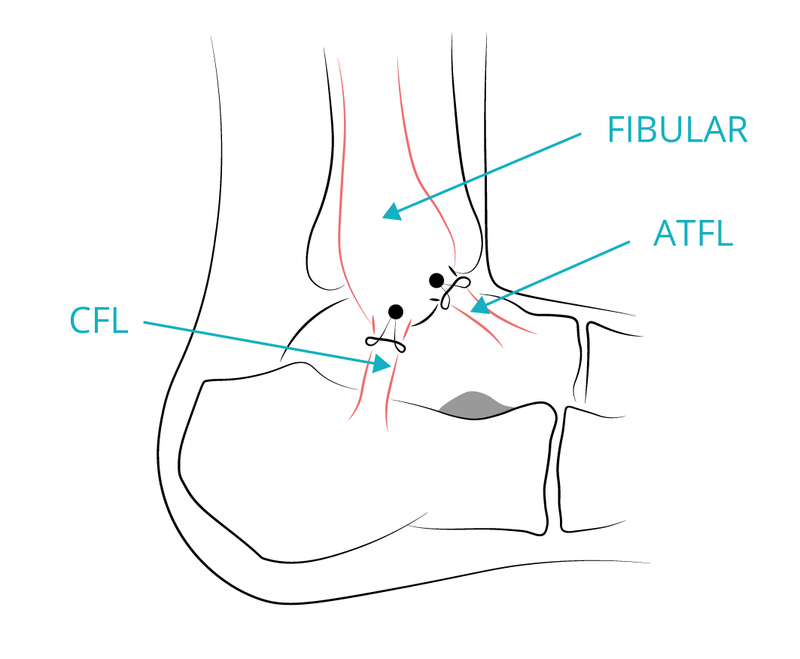 Small grooves are made in the bone on the outer side of the ankle (the “lateral malleolus”). Small anchors are placed in the bone and stitches attached to these anchors are used to fasten the ligaments back in place. The tissues on the outer side of the ankle are then stitched to the ligament to support it. The skin is closed, usually with a dissolving stitch buried under the skin. A plaster is applied to the leg. Occasionally the ligament is so badly damaged, or the ends are so scarred, that it cannot be repaired. In that case, the ligament would be augmented with an internal brace. If you are otherwise fit, and there is someone who can collect you afterwards and stay with you overnight, the operation can be done as a day case. This means that you are admitted to hospital, operated on and discharged home on the same day. If you have other medical problems, or have no-one at home with you, you will have to stay overnight, and you may have to come into hospital the day before for medical tests or treatment. Some people find that they need to stay in hospital the night after surgery because the ankle is painful and they need strong pain killers. Your hospital stay will be discussed and arranged in the clinic when surgery is offered. The operation can be done under general anaesthetic (asleep). Alternatively, an injection in the back can be done to make the ankle numb while the patient remains awake. Some Anaesthetists may offer you a regional block where the leg is numbed from the knee down. You can choose to have sedation to sleep through the operation. You will be given pain-killing tablets as required after the operation. A plaster cast from your toes to just below your knee will be applied while you are asleep. This will stay on for 2 weeks. You should only be up on your feet for 5-10 minutes per hour in the first 2 weeks after surgery to minimise swelling. You can go home when comfortable and safe. You will be seen in the clinic 2 weeks after your operation. The plaster will be removed and the ankle examined. If your ankle is healing well, you will be given a boot to wear. You can walk with your full weight on this. Physiotherapy will be arranged to start getting your ankle going again. You will wear the boot for 8 weeks. You will go through another full course of physiotherapy to make your ankle strong and flexible, to get back peroneal muscle strength and to retrain the fine nerve endings in your ankle to give the right signals to the muscles around them. This will last for several months. With the Brostrom procedure it is commoner to be too loose than too tight. The ankle may continue to give way even with a good repair which is not loose. This is because the small nerve endings in the ankle are not working well, the peroneal muscles have not recovered their strength or the Achilles tendon is tight. Physiotherapy usually improves this, but a few people keep wearing an ankle brace. In a few cases the wound is slow to heal or develops a minor infection. This usually settles with dressings and/or antibiotics. The nerves to the top and outer side of the foot run close to the ankle where the operation is done. In about 10% of people they are stretched or small nerve branches are cut. This produces a numb, sometimes tingly, occasionally painful area over the top or outer side of the foot. In many people this gets better over 6-8 weeks, but in about 50% of those affected it does not get better. How soon can I …. You can walk on your foot as soon as it comes out of plaster, wearing your boot. If your ankle is comfortable, you can work in a plaster and sit with your foot up most of the time (basically in a desk job), you could go back to work within a few days of surgery. On the other hand, if you do a heavy manual job you may need two or three months off work. How long you are off will depend on where your job fits between these two extremes. If you have your left foot operated on and have an automatic car you can drive within a few days of the operation, when your foot is comfortable enough. Otherwise you will have to wait until the ankle is strong and flexible enough to work the pedals, especially in an emergency situation. This will probably not be for 10 weeks after surgery. When you return to driving you need to take it gradually at first and drive only short distances. Also remember that if you drive before you can stop or manoeuvre in an emergency your insurance will not cover you in the event of an accident. Once you are out of the boot you can gradually increase your level of activity under the guidance of your physiotherapist. Once you can walk comfortably you can start running, swimming and cycling, increasing the distance covered gradually. Once you can run comfortably you can do some turning and jumping. As this recovers you can go back to low-impact, non-contact sports and finally to full contact sports. It is common to take 6-8 months to return to sports such as football or rugby.